I bought these to use with my Smartphone for mobile music (I can't stand earbuds). About 2 months ago my home audiophile Sennheiser 580s (http://www.stereophile.com/headphones/1294senn) stopped working, and the Koss Portapros were called into every day service. They're portables, so they obviously not as comfortable as the Sennheisers, and they do not cup your ear, and do not have the enveloping sound like the Sennheisers, but DAMN these thing hold up amazingly well against $200+ headphones. I miss my Sennheisers, but not nearly as much as I thought I would. I just can't think of a better $50 piece of audio equipment. jag heter carl rohman . mina koss hörlurar har gått sönder och jag har bara haft dom i 1 vecka . När jag sätter i den i min IPod så kommer det inget ljud men det går med andra hörlurar så det är inte fel på min ipod . snälla kan inte jag få nya , jag älskar mina koss hörlurar och skulle bli sjukt glad om jag fick nya. MVH / CARL ROHMAN. Well, were do i start... i guess at the beginning, with my impression of the sound. The thing about this is that the sound itself is quite good, but doesn't block out any sound at all from the surroundings. And it can be really annoying at times. Then second the comfort; I think the're a bit to stiff, they can also be really clamping around your head. And that's not good. Ok, i've been owning these over a year, and i've treated them very good. No matter two sets have already broke. So the're not very durable either. My first impression was good, but that was until i tried (and buyed) the a1100 from denon. That's when i realised this was s***, so i actually went out and through this in a container. But if your budget is tighter than mine i would slightly reccommend them as an option. Hello and first of all THANK YOU KOSS!!!! the Porta Pro is the best for me for many years!!!! enjoy my Gradolabs as well but for the price the QUALITY is superb!!!!! I have a lot of headphones (entry level, mid and hi end, like AKG K1000, about 25 units!!). The Portapro are the best relation quality for the money that you can find. They are very light and comfortables too. The sound is very flat, depending the positioning (touching or not your ears). They are a "classic" product, made by Koss since more than 20 years, and now made in China but with the same very good quality standars. They are well situated for jazz and pop music, but in classic and acoustic music they sound very well too... INCREDIBLE FOR THE MONEY!! As I said, I have very good headphones (senn 600 and 650, AKG 240, 270, 271, 500, 701, Grados...etc.) but I must confess that I spent most of time listening music with the Portapro...that's life. The Koss Portapro are a mid-size supraural open-back portable headphone. Nope, but you might want to consider one as these guys aren't super easy to drive for your ipod. An amp will help control it's bass and beef up the clarity of the highs. The difference in sound quality with an amp will likely be subtle in headphone of this price range. However,one thing to keep in mind...even with the small improvment an amp will make for these headphones,you can use it for future headphone upgrades as well. You can find an amp to pair it with here. The Koss PortaPro headphones are amongst the greatest bang for your buck of any electronic device you will buy, and is certainly the best ipod/portable headphone under $50. What makes you come to the conclusion they are the best open-back portable headphone under $50? - stellar sound performance...when compared to most other portable headphones, triple your price and you might be able to match it. - compact...who needs earbuds/IEM's when you can just fold your headphones up to take with you? - A Lifetime warranty...flimsy or not, Koss has your back. The Koss Portapro are best suited as portable headphones and are amongst my most suggested headphones to people who ask "what are the best Ipod headphones I can get for a reasonble price?". They would also go great with any laptop in addition to your portable player. This model's 23 years near or at the top of the best sellers in their category is hard to argue with. One guy has had more than 5 pairs of these headphones despite the lifetime warranty. He was so pleased with his purchase that he decided to repay Koss the favor everytime he wore them out or did something to them. Alternatley they are good gaming headphones. Although they are musically orientated and don't have a mic, their big bass emphasis and large soundstage make them good at imaging and making you feel explosions. You could even use these as headphones for jogging. Nearly every review pointed out that the unique design holds them firm to your ears and they will almost never slip off. The combination of pressure from the earpads and the piece that rests above your ear is a well thought out piece of engineering. Its both comfortable and functional. Why there are not more headphones with a similar design out there I will never know...I guess too many people think the functionality just isn't worth the aesthetics. The Koss Portapro sports an open ear coupler design meaning they leak sound out and let ambient sound in. So, If you are listening in noisy places often then perhaps you should look into our in-ear or noise cancelling page for suggestions. With Over 92% of user headphone reviews rating the Koss Portapro positively (score of 4 or 5 based on a 5 point scale of several hundred reviews) and not a single professional reviwer giving it less than a 7/10 (based on 6 reviews), you know these Koss' are worth every penny. 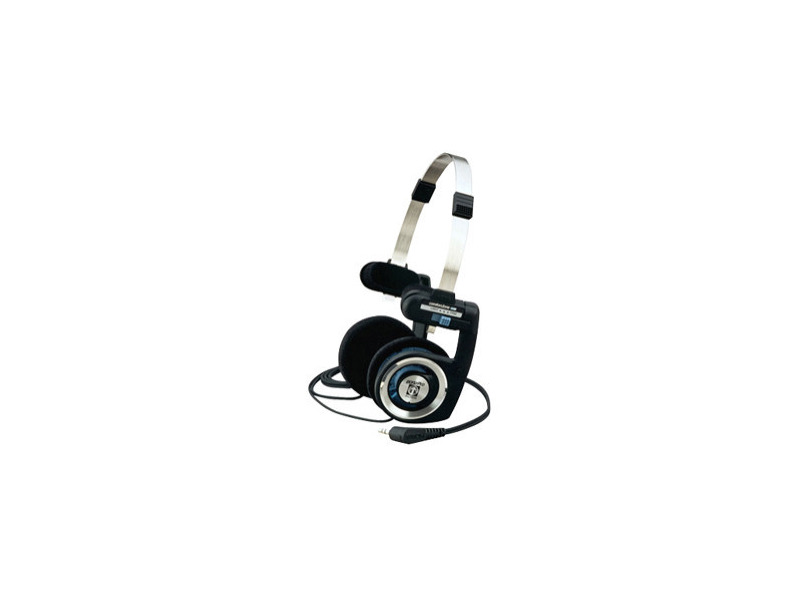 The portapro is often described in headphone reviews as warm with a strong emphasis on the bass. Few found it overpowering and nearly all describe the mids as being unaffected by the powerful bass. It is also said to be musically orientated, reporduce intruments very clearly, and have a large soundstage. The few reviews that complained about the sound mentioned that the highs were somewhat lacking and/or colored, but lets be honest, 92% of hundreds of people and 23 years of selling like hotcakes can't be wrong...can it? If Comfort is as important to you as it is me, then listen up. GET THESE HEADPHONES! I can't tell you how much I hate when headphones press against my ear or head too tightly. Koss's design on these gems is a marvel. Temporal pads split the clamping force on your head up between the earpads and the temporal piece allowing you to wear the headphones for hours on end comfortably. And to boot, it makes them fit on your head very securely, securely enough to go for a jog and not worry about them slipping around. A LIFETIME WARRANTY!... and I thought Sennheiser was gernerous! Yes way! no questions asked, just send them to Koss with a check/cash for return shipping and a couple weeks later you have a new pair of Koss Portapros. Are you a little bit skidish of buying anything but earbuds or IEM's for portable use...Don't be! The Koss Portapro fold up into a very compact package and some retailers even include a pouch or case for you to plase them in. .With these,i heard sounds that i didn't hear b4 with my panasonic headphones. these are amazing and they are tiny when folded. bought off amazon for 30 bucks plus tax. and Ihave to say that these are my best headphones, bettr than any headphones under 70 bucks, and definately worth the price. I was reading the reviews for the Koss PortaPro headphones and from what I've read these do seem like a favorable and affordable headphone. Unfortunately, I am unable to rate this specific headphone because I do not own one, nor have I heard it for myself. However, I am able to provide a comment and a review on Koss in general -- and more specifically the 2 pairs of Koss Pro 4AA that I have owned over the years. While Koss does make good-sounding headphones which are easy on the pocket, I've found that they are not built to last. The both pairs of Pro-4AA's I owned both developed problems within the first couple of years. The first set I owned the right speaker just stopped working -- and the second set developed a "shorting" in the wiring for the right speaker, causing it to intermittently "crackle" and cut in and out. The only reason I bought the second set was because I thought the problem in the first set was a fluke --and everyone should get a second chance, in my opinion. But when the second set developed problems in a relevantly short period of time that pretty much put a damper on my opinion of Koss products. If affordability is what you seek then Koss is it -- if its longevity then I would recommend staying away. I believe in "second chances" ... but not in "three strikes you're out." I hope some of you find this info helpful. My Home equipment is Lexicon. My current speakers are custom made (by me), onboard tri-amped (Electronic LR4 crossovers) Focal, Cabasse and separate Rythmik Audio 15" stereo servo Subs. My Full size Van has 3 way separates (a/d/s - before they were sold), the amp...Soundstream DaVinci, controlled by a Nakamichi MB100. My old home system is still intact, Yamaha M1 amp, Yamaha C1 pre, a/d/s 910 speakers (circa 1981). Why $30 headphones? If you'll remember back to the 70's Koss were the finest headphone manufactured. Back then speaker drivers were made with Alnico magnets and paper diaphrams. This philosophy carried down to headphone design. Regardless of new materials and technologies many (most) audiophiles still regard the old materials superior. For good reason. These headphones are examples of the component quality of a bygone era. I have a pair of Klipsch Custom 2 in ear monitors, which are very good, and the PortaPros are far superior. The PortaPros are able to reach the lower octaves. I'd characterize their sound as warm. Meaning they probably lack slightly in the top octaves. I do not believe the Bass is bloated at all. They do not lack for dynamic range and I'd guess the size of the drivers in these headphones are likely on the large size when comared to their competition. Technical advancement constanly pushes manufacturers to smaller sized components. When it comes to sound there is nothing more important than air displacement. The PortaPros displace plenty. A: They are not highly efficient (although they are more efficient than other highly acclaimed models, i.e. Grado, Sens). D: Slightly weak in the highest octaves. Overall the PortaPros represent a value unheard in these time. I believe their primary competition is more accurately in the $2-300 class. Excellent headphones! Without question, the best value in Headphones today! I should maybe have listened to these headphones a bit longer before I posted this review. )I have just had them for a couple of days). But I am just so deeply disappointed about the portapro that I had to write this now. If you like bass - you got bass!!!!!!. But that is also the only thing you are getting. Even my daughters $10 NoName headset has more clarity than this. Do yourself a favour, spend your money on something else. I have tried them on my Ipod, on my Beresford 7520, my Zero dac, and both of my amps (Rotel RA-06 and Pioneer A6). Maybe they will get better after a period of burn in. But so far they are rubbish.